The pool facing Executive Rooms at our 4 star Nairobi hotel feature a private balcony and double bed. The room features an LCD Flatscreen TV with DStv channels, fully stocked mini bar, iron & ironing board, ceiling fan, tea/coffee making facilities and private bathroom. Extra complimentary amenities include in-room WiFi access, direct line phone with voicemail, safe deposit box and hair dryer. 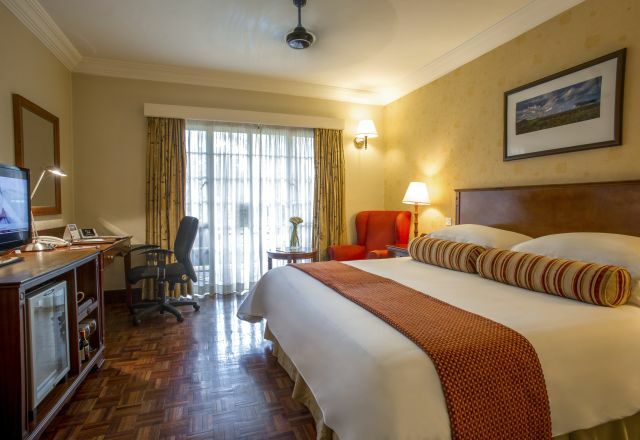 The pool facing Executive Rooms at our 4 star Nairobi hotel feature a private balcony and double bed.